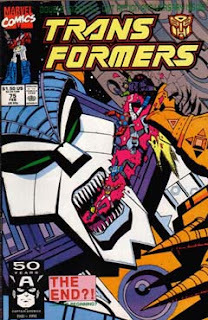 The eighth day of Crusademas finds the boys tackling probably the most well-known title from under the Longbox Tree: Transformers. But we're going back the early days to a Transformers tale you may have missed from the bygone Marvel era - issue #75. We’ll give you a hint: it's a big climactic battle. Will talking robots still stand up after a couple decades? Only Santa knows for sure....or you could just take a listen.... Carla Thomas will be provided via DJ Kristatos with her Christmas tune, "Gee Whiz, it's Christmas!"